The 13th August 2013 was a very good and special day for Phuket’s divers. In fact, in honor of her Majesty Queen Sirikit’s 81st birthday, divers community and volunteers met to cleanup our reefs and beaches. GO ECO PHUKET is a non-governmental organization recognized by the Thaï government, that takes place every year, this year in August. This year, more than eleven diving companies and 1500 divers and non divers were present to clean up and help to protect the oldest most productive ecosystems on earth. Moreover, a lot of volunteers came, included divers of other countries who were in holidays, Thai people and students and schoolchildren from educational establishments of the island. Everybody was ready to begin this cleaning day at 7:00 am under the sun at Chalong Pier for a small briefing, TV interview and thanks for all those involved in this action. Our Scuba Cat Team took about 1.5 hours to go to Racha Yai with MV Scuba Fun, and about 22 people on board, included 10 volunteers. Our destination once we arrived were the Bay’s 2 and 4 for the day. Scuba Cat were given the responsibility for putting down 2 new mooring lines at Bay 2, the owner Sarah Kench, has donated the use of 2 1000 tonne anchors for the lines to be attached to, this will enable more mooring opportunities for the dive and snorkel boats visiting the island. 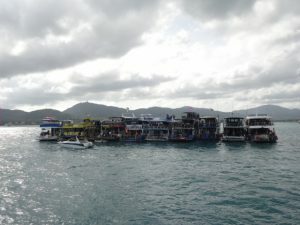 Once the equipment was on the divers went for the dives to try to make the reef of Phuket one on the top diving destination in Thaïland and in the world !! After approximately two fifty dives each and many efforts, Scuba Fun and his team have collected bottles, clothes, old dead fish for analyses, metalics and plastics debris, ropes, ans fishing nets. To close the day on the way back, all dive boats stood in line to celebrate this good and productive day and take pictures before going back to the pier to sort and weigh all the collected debris from the day. We would like to thank our sponsor for the day All About Scuba Diving, the crew and volunteers who donated their time to help in this underwater clean up. Summary of the day : 4 356 kilos of debris collected in total ! GO ECO PHUKET, it’s doing what you like, while participating in the environmental protection ! This entry was posted on Friday, August 23rd, 2013 at 12:39 pm	and is filed under Environmental News. You can follow any responses to this entry through the RSS 2.0 feed. Both comments and pings are currently closed.